1. SoftWash Systems In-Network Companies pledge to meet and maintain local minimum licensing standards. Business licenses should be kept on hand and available in the office and on the service and sales trucks. 2. SoftWash Systems In-Network Companies pledge to adhere to their States minimum standards liability insurance, auto insurance and workers’ compensation insurance. Insurance certificates will be kept on hand and available in the office and on the service and sales trucks. 3. SoftWash Systems In-Network Companies pledge to identify their vehicles clearly with company name, logo, and contact information according to local standards. SoftWash Systems In-Network Companies understand that this is not only law in some communities but also good business practice. 4. SoftWash Systems In-Network Companies pledge to present customers with clear and complete proposals, before commencing contracted work. This proposal will be on a printed business form or type written proposal. 5. SoftWash Systems In-Network Companies pledge to produce a complete and correct scope of work for custom-er’s approval before commencing contracted work. This scope of work will be on a printed business form or by type written contract or scope. 6. SoftWash Systems In-Network Companies pledge to run background checks on employees, not placing customers in possible jeopardy. Employees with questionable backgrounds will be utilized only in areas where interaction with the public is not possible. 7. SoftWash Systems In-Network Companies who maintain a web site pledge to use such site for company promotion, customer education, and commerce. The In-Network Company will display license numbers and proper SoftWash Systems co-branding on the header or footer of the website. 8. SoftWash Systems In-Network Companies pledge to wear uniforms for professionalism as well as for safety. SoftWash Systems In-Network Companies understand that uniforms are key in presenting a clean professional company. 9. SoftWash Systems In-Network Companies pledge to issue company identification badges for all employees. ID Badges will show the company logo, appropriate SoftWash Systems co-branding, employees name, employees photo, and employees job title / position. 10. SoftWash Systems In-Network Companies pledge to resolve customer complaints quickly and equitably, closing the com-plaint to the best of the member’s ability. SoftWash Systems In-Network Companies are strongly recommended to utilize con-sumer dispute resolution services like those found at the BBB. 11. SoftWash Systems In-Network Companies pledge to make sure softwashing cleaning equipment will meet all sub-parts of this section. Each standard will be applied to member’s equip-ment whether retail manufactured, custom designed, or owner installed. 12. SoftWash Systems In-Network Companies pledge to insure that when using chemicals for softwash cleaning that the outgoing pressure of the application pump (at the pump head) does not exceed 100 PSI. 13. SoftWash Systems In-Network Companies pledge to insure that when using chemicals for softwash cleaning that the outgoing pressure of the application apparatus (at the spray tip) does not exceed 80 PSI. 14. SoftWash Systems In-Network Companies pledge, when applying the softwash cleaning chemical solution, di-rectly on an asphalt shingle surface, contractor will use a fan spray tip (15-60 degrees) at a safe distance. It is to be no clos-er than 24” from the surface of the roof. 15. 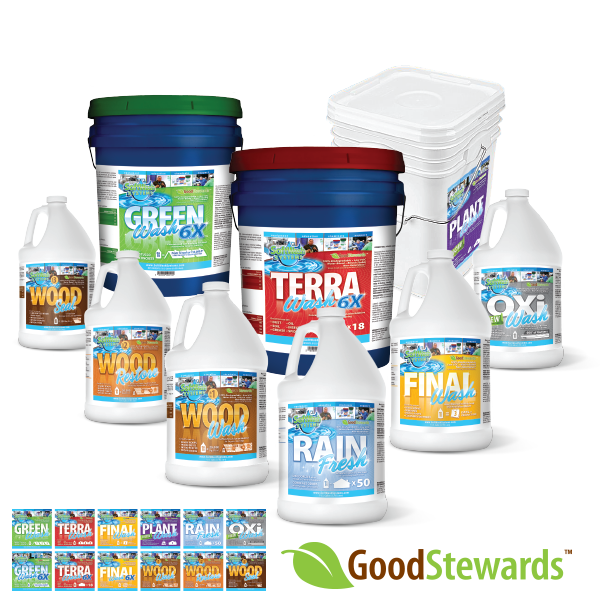 SoftWash Systems In-Network Companies pledge to insure that softwash cleaning that utilizes a zero-degree stream tip is for chemical application only. Applications utilizing a zero-degree stream tip are for long distance applications of chemical in excess of ten (10) feet. 16. SoftWash Systems In-Network Companies pledge to that they will not in any situation use mechanical agitation for removal of stains from roofing materials. Mechanical agitation can be but is not limited to, high pressure washing over 200 psi, use of flat surface cleaners, brushing, scrubbing, or scrap-ing. 17. SoftWash Systems In-Network Companies pledge to have written standards for cleaning processes using vari-ous techniques and chemical ratios for cleaning different roof and exterior surfaces. Training specific to member’s equip-ment will be made available to users / employees. 18. SoftWash Systems In-Network Companies pledge to insure that spraying equipment and holding tanks are main-tained and not leaking, or illegally emitting chemicals and/or VOC’s. 19. SoftWash Systems In-Network Companies pledge to insure that equipment; either mounted to trailers and or directly to motorized vehicles, will be secured in accordance with US DOT standards. Mounts should be inspected and rated bi-annually. 20. SoftWash Systems In-Network Companies pledge to insure that spraying equipment tanks conform to US DOT standards and remain within carrying capacities based upon drivers licensing. Furthermore, tanks holding chemi-cals should not be broken down or weakened by the chemicals stored within. 21. SoftWash Systems In-Network Companies pledge to use SoftWash Systems Good Stewards softwashing chemicals & surfactants for their softwash cleaning operations. 22. SoftWash Systems In-Network Companies pledge to follow the Asphalt Roofing Manufacturers Association (ARMA) Technical Bulletin for cleaning roofs, including ac-cepted chemicals. 23. SoftWash Systems In-Network Companies pledge to use chemicals that have been tested and approved for mixing with hypochlorite solutions. 24. SoftWash Systems In-Network Companies pledge to become educated on the safety and usage of softwash cleaning chemicals, their storage, and the impact they may have on the environment. 25. SoftWash Systems In-Network Companies pledge to mix their roof cleaning chemical solution strictly according to the chemical manufacturers label and provide training to em-ployees on mixing chemicals that are available to them. 26. SoftWash Systems In-Network Companies pledge to ensure that the final cleaning solution shall not exceed a PH of 12 or an overall hypochlorite percentage of 4% for cleaning roofs. Exceeding a PH of 12 or an overall hypochlorite percentage of 4% will result in a solution that is too corrosive and detrimental to many roofing types, possibly voiding the roofing manufacturer’s warranty. 27. SoftWash Systems In-Network Companies pledge to ensure that chemicals are carried / transported in accordance with manufacturer’s label (and take the steps neces-sary) to keep incompatible chemicals from interacting with each other. 28. 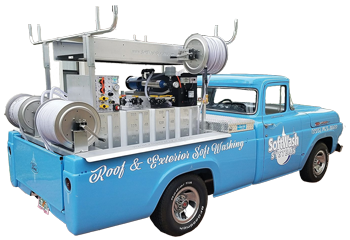 SoftWash Systems In-Network Companies pledge to use chemicals like Tri-sodium phosphate in any roof cleaning solution as applicable by local law. Chemicals like TSP are unregulated in many areas but strictly regulated in others. SoftWash Systems In-Network Companies are ad-vised to educate themselves as to the use and transportation of chemicals within their commerce area. 29. SoftWash Systems In-Network Companies pledge to use chemicals that are environmentally responsible and/or bio-degradable. Where this is not possible, SoftWash Systems In-Network Companies are advised to utilize proper disposal and or collection methods to insure that good stewardship of the environment is observed. 30. SoftWash Systems In-Network Companies pledge to keep Material Safety Data Sheets (SDS) for each chemical carried and in use on their truck. SoftWash Systems In-Network Companies are strongly advised to receive training on chemical disposal as well as spill clean-up and removal. Trucks are advised to carry shipping papers, a spill contingency plan, local emergency numbers, as well as contact info for Chemtreck or InfoTrack (this is required by law in all 50 states). 31. SoftWash Systems In-Network Companies pledge to participate in yearly educational opportunities that are abun-dant within the cleaning community and at SoftWash Academy. A list of some of those opportunities will be kept on the Soft-Wash Systems Community website to aide SoftWash Systems In-Network Companies with education elements. 32. SoftWash Systems In-Network Companies pledge to be proficient in the proper placement of ladders regarding correct angle of slant. Member should be able to explain in detail the types, parts, and proper placement of a ladder to ensure no movement will occur. 33. SoftWash Systems In-Network Companies pledge to be proficient in fall safety, the safe use of body harnesses, the inspection of fall positioning and or arrest equipment, and the required times of use of fall positioning and/or arrest equipment. SoftWash Systems In-Network Companies should also be educated in the proper use of anchoring systems associated with the use of these systems. 34. SoftWash Systems In-Network Companies pledge to be proficient in the safe manner of accessing, ascending, and walking a roof. SoftWash Systems In-Network Companies should receive training for proper roof traversing techniques. 35. SoftWash Systems In-Network Companies pledge to be proficient in the use and operation of high lift equipment if and when it may be used during the course of business. SoftWash Systems In-Network Companies are strongly advised to be trained and approved by the company safety officer and/or equipment rental company before using high lifts. 36. SoftWash Systems In-Network Companies pledge to use respirators and/or nuisance gas masks. SoftWash Systems In-Network Companies are advised to be trained in the proper use, care, and storage of respirators. Employers are very strongly advised to have an OSHA respirator program in place that is applicable with the type of mask in use. 37. SoftWash Systems In-Network Companies pledge to use safety eyewear / face shield whenever mixing or spraying chemicals and/or during operation of equipment that creates potential for eye accidents. SoftWash Systems In-Network Companies are strongly advised to undergo training for the use of eye protection. 38. Whereas State or Federal DOT requires operators to have a commercial drivers’ license and/or other endorsements, Soft-Wash Systems In-Network Companies pledge to comply with these requirements. 39. SoftWash Systems In-Network Companies pledge to insure that remaining and/or refuse chemical containers are cleaned out after use and discarded (preferably recycled) in accordance to their local municipalities’ regulations. 40. SoftWash Systems In-Network Companies pledge to inspect and rate their equipment regularly to ensure that the equipment standards are met, avoiding damage to customers’ roofs as well as possible safety risks. 41. SoftWash Systems In-Network Companies will provide a “First Aid” class. SoftWash Systems In-Network Companies are likewise advised to keep documentation of this training for all helpers and employees. 42. SoftWash Systems In-Network Companies will provide a “ladder safety and inspection” class. SoftWash Systems In-Network Companies are likewise advised to perform regular inspections of ladders for damaged, worn, or missing hard-ware. 43. SoftWash Systems In-Network Companies will provide a “Personal Protection Equipment” (PPE) class. SoftWash Systems In-Network Companies are likewise advised to keep prop-er documentation of assignment and use of PPE by helpers and/or employees. 44. SoftWash Systems In-Network Companies will provide a Fall Protection Training Class. SoftWash Systems In-Network Companies are likewise advised to keep documentation of this training for all helpers and employees. 45. SoftWash Systems In-Network Companies will complete a DOT safety review. This is a free service provided by your State Commercial Vehicle Compliance Office. SoftWash Systems In-Network Companies are advised to keep documentation of this review. 46. SoftWash Systems In-Network Companies will complete proper training for application of roof and exterior cleaning solutions to ensure that the building surface life is extended and no damages occur. 47. SoftWash Systems In-Network Companies will be trained in the recommended procedure for collection of “run-off” or waste streams, following local municipal BMP’s. (Best Manage-ment Practices) and as not to violate the US Clean Water Act. 48. SoftWash Systems In-Network Companies are encouraged to attend small business workshops and/or utilize entrepreneurial centers in their area. SoftWash Systems In-Network Companies should understand that business is ever evolving and as their business grows, it will interact with differing laws and governmental requirements they may be unaware of. 49. 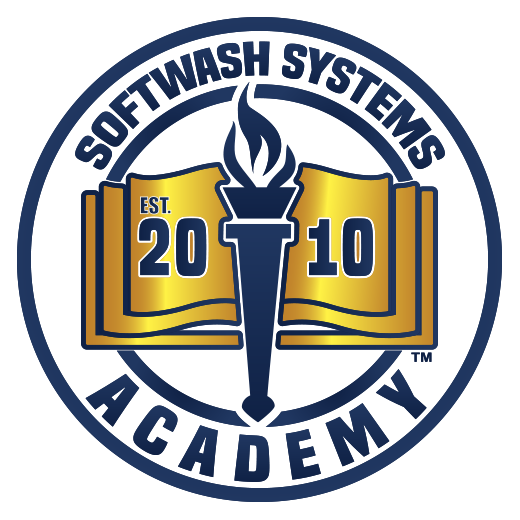 SoftWash Systems In-Network Companies are encouraged to receive all of the above training from a vocational school like SoftWash Academy. SoftWash Systems In-Network Companies are likewise advised to keep documentation of this training for all helpers and employees. 50. SoftWash Systems In-Network Companies employees will complete a total of 12 credits (6 Hours) of annual Continuing Educational Units, (CEUs) for professional improvement yearly. SoftWash Systems In-Network Companies are likewise required to keep documentation of this training for any and all employees.